Am sure that wine puritans come out in a rash at the thoughts of adding water to wine, but in Hungary, it’s almost de riguer in the summer. Far from being a ‘girly’ drink, the various forms of wine spritzers are imbibed by men and women and boys and girls alike. I remember my first breakfast in America when, on asking for a fried egg, I was presented with a list of choices including over easy, basted, broken, and sunny side up. When the Starbucks craze took root and coffee choice was no longer limited to black or white, I was just as mithered. And when I first came to Budapest, asking for a wine and soda landed me in the same bed of confusion. There’s a science involved and getting the measures right is all about mood and circumstances. Collectively these are known as fröccs and Austria and Hungary both claim the rights to this particular phenomenon. I was in Győr a few weeks ago wandering around on a summer Saturday that was doing an excellent job of pretending it was still stuck in February. 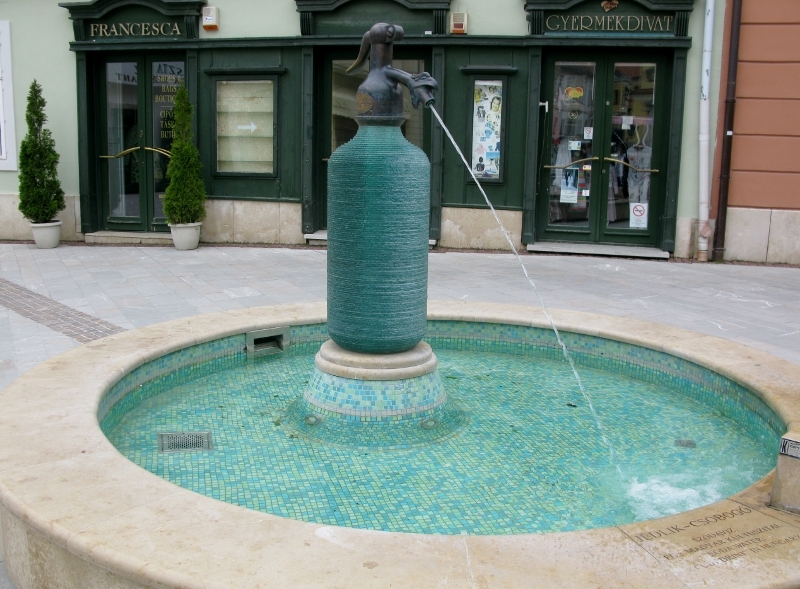 We came across what might well be indisputable proof that the whole fröccs thing did indeed originate in Hungary – a commemorative fountain with a very, very large soda water bottle in the middle. The engraved legend says that a chap by the name of Jedlik invented soda water, ‘a cult drink in Hungary’. Mind you, an Internet search says thatBritish clergyman Joseph Priestley invented carbonated water in 1767. Interestingly Ányos István Jedlik was also in the church – he was a monk – although not born until 1800, well after Priestly first infused water with carbon dioxide. And more trivia: the first company to sell soda water was Thwaites’ Soda Water in Dublin, set up in 1799. What to believe? Whom to believe? Perhaps there are variations of carbonated water that each could lay claim to. Perhaps Jedlik discovered it having never known Priestly had gotten there before him. Who knows? And who cares? Suffice to say that the fröccs phenomenon makes summers in Budapest bearable.